It’s the start of a new era in L4 as Everton prepare for life without David Moyes. It’s almost impossible to write a season preview without continually referencing the Scotsman’s work. Moyes was Everton. Fans seem pretty split right now. They’re either looking forward to a breath of fresh air from Roberto Martinez who could finally make the push the club has often threatened to in recent years, or they’re dreading an inevitable decline because Moyes milked every last penny of the money available. A lack of cash defines Everton, and, as is now tradition, speculation is rife about who the club is going to sell rather than buy. Marouane Fellaini looks to actually really be on Moyes’ Manchester United radar now after failure to capture first choice targets. The Old Trafford outfit may also still come back for Leighton Baines after a failure so far to flex their financial muscle in the transfer market. With a new manager on board who espouses a different philosophy from the pragmatic Moyes, it’s necessary to look at what the new encumbent did at his previous club. Going forward, Wigan improved last year on previous by posting fewer shots overall but taking them in better areas more central and closer to goal. Throughout Martinez’ time the Latics were pretty efficient in front of goal, scoring at the rate they should have. Their output stretched from around a goal a game to a goal and a quarter. Everton also improved going forward last year both increasing shot numbers overall and in better areas to boot. However, not once in the last 3 years did Moyes’ side even get close to being efficient in front of goal. Last year they were particular inefficient. However, the Blues still outscored everyone below them bar Liverpool and posted 63 points, their joint 2nd best total since 1988. As you can see, Everton were big crossers of the ball from high, wide positions. Over half the chances sent into the wheat zone were made this way. The Toffeemen also worked a pretty good number of chances to the wheat zone from within the box itself. What Everton didn’t do under Moyes was thread the ball from “the hole”. A lot of Everton’s play over recent years has been to methodically work the ball wide to create overloads on the left side of the pitch. Much is made in the media and amongst fans of Martinez’ attractive, progressive football. The numbers suggest this is a myth. Wigan created around half the chances that Everton did in the wheat zone. But the proportions of how they made them were almost exactly in keeping with how Everton made them. Lots of crosses, a fair amount of chances created in the box and very few through balls. 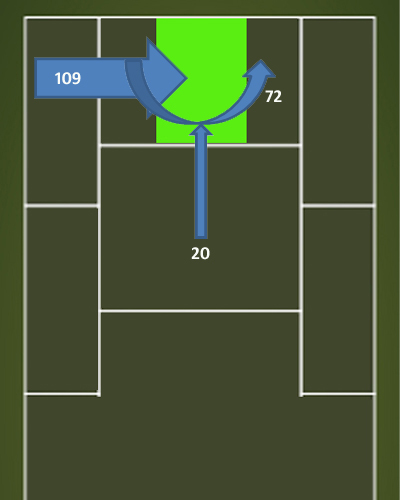 Wigan played a lot of their football away from danger areas and proportionately took a lot more shots from ‘chaff’ zones – from wide angles and long distance pot shots. Everton preferred to hem opponents in – no team has controlled the football in the opposition half more than Everton over the last few years. That’s no team – not United, not City, not Arsenal, not Chelsea. And this could be one of Everton’s problems with efficiency in terms of converting chances. The pace of Jagielka and Distin enables them to play a high line. With Fellaini able to hold up the ball, Everton can then rely on a small squad of decent footballers to keep the ball there. But being squeezed in allows defences to get set. And if a defence is set, it doesn’t matter much if you have the best crosser of the ball in the league in Baines and the best converter of headed chances in the league in Fellaini – it’s still going to be difficult to score goals. 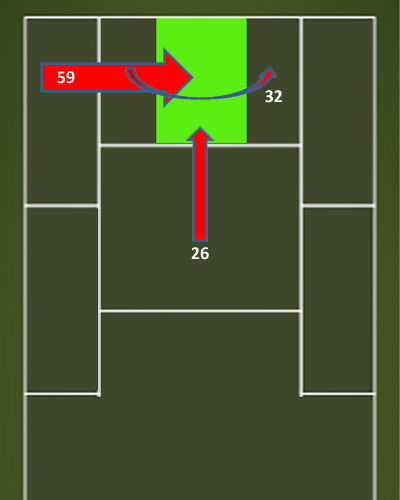 Unless defences are pulled away from their own goal, space in the box is at a premium. Everton relentlessly bombarded well defended boxes in a footballing war of attrition. Over time it worked and outcomes were pretty good in terms of points and goals over the season. However, there’s an underlying feeling around Goodison that this team is still capable of more. 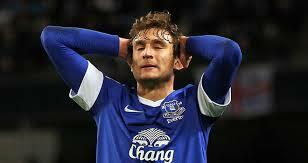 Nikica Jelavic suffered a lot last season. The fact is that last year, Jelavic was getting far fewer touches of the ball and having to deal with far more aerial chances arriving his way (13% first season compared to 40% last). This was mainly due to Fellaini’s presence up front being so prominent. It’s plain to see the kinds of chances the Croatian thrives on – ones played in front of him on the deck, but his confidence was so shot by Christmas that even when they arrived, he started fluffing those too. Jelavic has looked in decent nick in his fleeting appearances during pre-season and scored an absolute belter against Real Madrid last week. Everyone at Goodison is hoping he can regain his goalscoring touch. Maybe Martinez’ less in your face approach will suit Everton and knocking the ball about in less threatening zones will draw those defences out. It may also provide Kevin Mirallas with the kind of open spaces in behind that he thrives on. Conversely, defence cannot be said to be Martinez’ strength. Wigan’s combined goal difference in the league during the Spaniard’s 4 years at the helm was a whopping -109. Last season, Wigan conceded 13 goals more than could have been expected. This made them the least efficient defensive unit in the league by some distance. I have numbers for many things but how this is going to play out next year is difficult to determine exactly. Everton have a better goalkeeper and better defenders than Wigan do, but the difference in numbers here is alarming and is the main source of worry to Martinez sceptics. Four players have arrived so far and it’s difficult to see any further bodies coming in at this stage without one leaving. If Martinez is going to survive at Everton then how he handles limited cash reserves is going to be THE most important factor during his tenure. Moyes understood this and from the off treated the club’s cash like his own by gradually replacing older, clapped-out players with younger, hungrier talent. The striking thing about Martinez’ two main bits of business so far – Arouna Kone and Antolin Alcaraz – is that Moyes wouldn’t have touched either with a barge pole if he was still in charge. Kone will be 30 before the end of 2013 and had a major knee operation a few years back. Alcaraz turned 31 last week, spent last season’s run in injured and is currently injured again. This pair may be useful additions to the squad for the upcoming season, but beyond that, they’re a leak of resources that Everton simply don’t have. To balance the age thing, 23 year old Spanish goalkeeper, Joel Robles, another buy from Wigan, comes in to replace the outgoing 30 year old Slovakian international, Jan Mucha. It’s unlikely Robles will replace Tim Howard this season. The youngster edged out Ali Al-Habsi towards the end of last season at the JJB, but Wigan continued to leak goals like a sieve. The player everyone wants to see is Spanish ‘prodigy’ Gerard Deulofeu, who top-scored for Barcelona B with 18 goals last year in Segunda Division. It’s pretty unclear how much this kid will be used during the course of the season. It’s taken until this week for him to feature in Everton’s pre-season and only then for a few minutes. Also, Everton only have him for a season on loan. To me, the (dreaded) youtube reel of Deulofeu looks more like an advert for how bad second tier Spanish football is rather than an endorsement of his talent. Let’s hope he actually is something kind of wonderful. What we’re left with then, is Kone probably being the new player who will get most minutes next season. I have studied the Ivorian’s shots and goals going back to 2010 when he started playing again regularly after cruciate knee ligament surgery. Remarkably he has retained a decent turn of pace but what’s in store goals-wise probably isn’t what Evertonians may expect having seen him terrorise John Heitinga last season. Kone may occasionally skip past some challenges and motor down on goal before smashing home, but he only does this a few times a season. His bread and butter goals are often close- in scrappy affairs and he’s not a stylish finisher. Still, the last two and a half years have been decent for him. For the type of shots he takes, he’s scored more than expected in both seasons. However, last year saw a little decline and other work done on this site shows that at his age, the trend is unlikely to reverse. 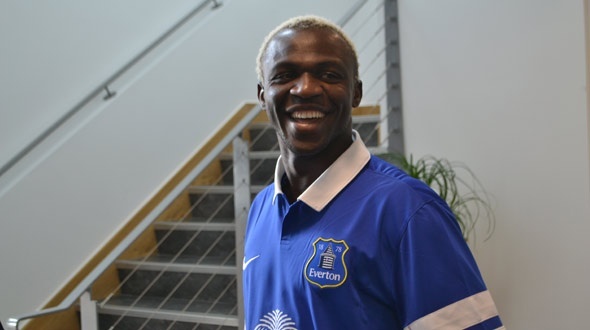 At most, Everton fans can expect Kone to just about reach double figures goals-wise next season in the league. If Everton can get to the 1st of September without losing players, there’s no reason to worry about any huge decline in the coming season. Only rivals Liverpool were within touching distance last season and Everton have a decent level of talent to call upon in most departments. The main problem for Everton continues to be lack of squad depth. The first choice XI has shown on many occasions that they can match the big boys (even if they don’t actually beat them very often). The bench, however, is often made up of spark-free senior players of similar or lesser ability to the ones they’re replacing or kids who have yet to make the grade. Unlike most fans, if one of Baines or Fellaini had to be sold, I’d prefer that one to be Baines. He’s getting on, he’ll lose value and there’s a ready made replacement for him in situ in Bryan Oviedo. Coleman could pick some attacking slack up on the right hand side too. Fellaini leaving would leave a huge gap in a not-so-strong central midfield area and the likes of James McCarthy simply won’t fill such a void. It’s unthinkable that Everton’s attacking efficiency won’t get better next season as the play becomes less direct. Any increases here though look likely to be offset by a greater defensive frailty. It will take time for Everton’s players (especially the centre backs) to adapt to life under Martinez. 7th place looks a realistic target for The Blues next season. Follow me here on Twitter.